On May 14, 2013, I departed Kingman, Arizona, heading for Flagstaff, one hundred forty-seven miles east on Interstate I-40. The altitude of Kingman is 3350 ft. while the altitude at Flagstaff is more than twice that at 6900 ft. What those statistics do not indicate are the many mountain passes and low valleys that I-40 traverses in that distance. The vertical rise and fall is like no other similar stretch on I-40. By the time I reached Seligman, Arizona, I was ready for a break and my Nissan Titan truck was ready for fuel. 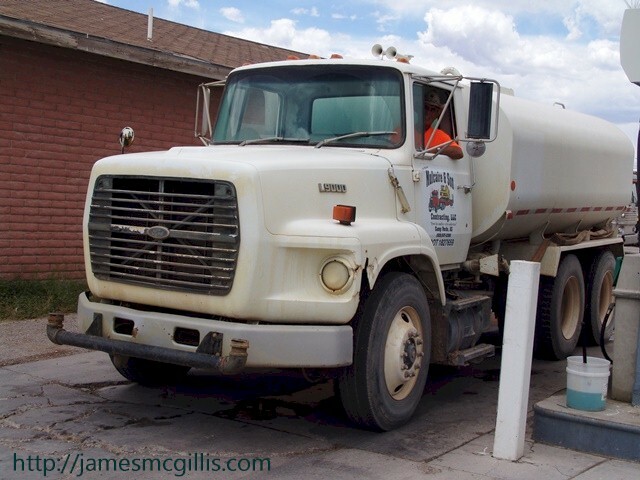 Before I departed Seligman, a 1980’s vintage Ford L9000 water truck pulled in for fuel beside me. When I introduced myself, the proud driver of this venerable workhorse introduced himself as “Colonel”, which was good enough for me. Before he pulled away, I took several pictures of him and his iconic desert water truck. Back on I-40 East, I lamented the poor condition of our interstate highways. To be sure, I-40 gets both heavy truck traffic and harsh winters, but the rutted and crumbling highway had me grumbling to myself about the poor state of our infrastructure in America. “Why don’t they ever fix this highway?” I asked aloud. Although I was late for an appointment in Flagstaff, I slowed down to prevent damage to my truck or travel trailer. Soon, I was to experience highway reconstruction at its finest, thanks to our federal tax dollars. As I approached the crossroads town of Ash Fork, Arizona, lighted signs and myriad orange cones appeared along the highway. From Ash Fork, Arizona Highway 89 heads south to Prescott and Wickenburg, Arizona. In times past, an inattentive motorist might miss the small signs that identified the highway junction. 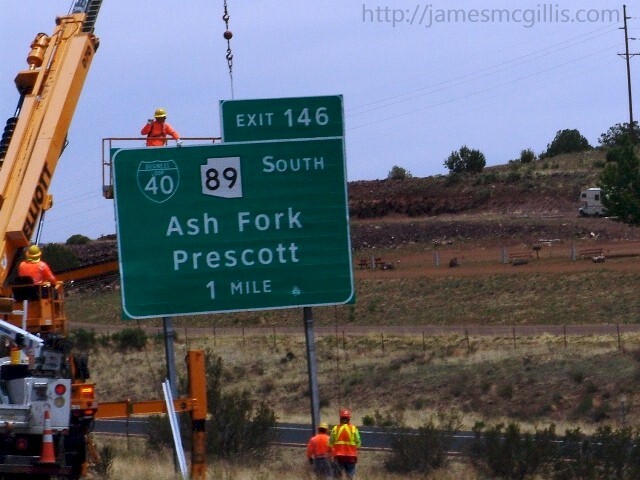 After May 2013, no one would miss the gigantic new signs installed alongside I-40. As a large mobile crane lowered a new sign into place, a construction engineer guided the process from a platform fifty feet in the air. 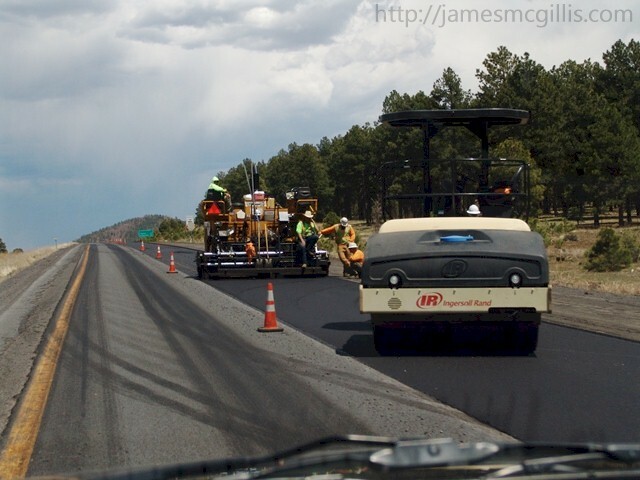 With the construction excitement of Ash Fork behind me, I began to notice smooth new pavement in the right lane of the interstate highway. A semi-truck and trailer loaded with California onions glided up over a hill on its way to the east. For me the shaking and jarring of crumbling pavement ended. 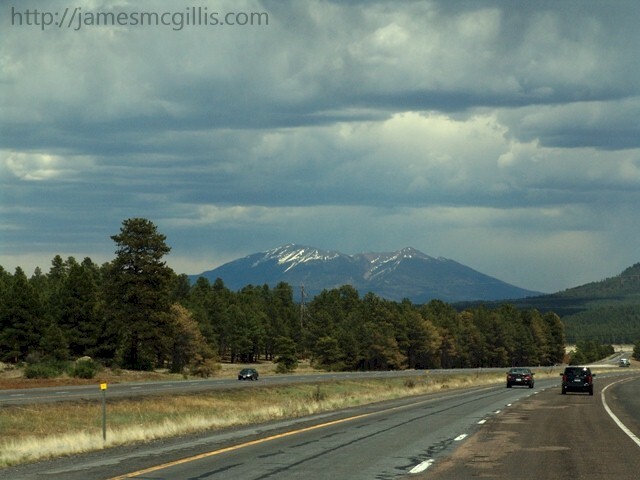 With a sigh of relief, I could relax a bit as I rolled smoothly toward Flagstaff. Soon, the road was climbing again as it made its final ascent toward Williams and Flagstaff, beyond. Twice more along the way, I encountered large crews of workers and their equipment. 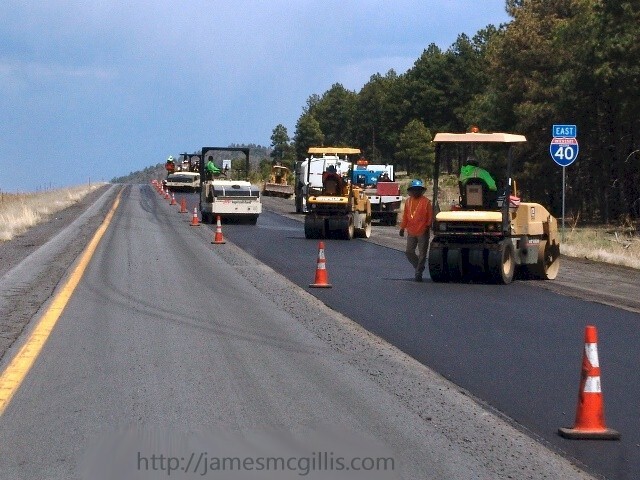 They were repairing, restoring and resurfacing the same highway I had cursed only an hour before. Any delay I experienced that day paled by comparison to the glee I felt about my country and its ability to fix its infrastructure issues. In times past, signs erected at each project would say, “Your federal highway taxes at work”. If we abolish taxes in America, who will pay to keep commerce and tourists safely rolling along our highways? Even as I sped by, I could see the efficiency and care that each road crew applied to their work. Awash in neon-green or bright orange shirts, each person was actively accomplishing their task. The whole scene was in motion, with heavy rollers following the monster pavers up ahead. On the back of one paving machine sat the boss. Along with two quality control experts, he was assuring that the new asphalt went down smoothly and firmly. Farther on, crews were stripping old asphalt from the road and recycling it into new asphalt for the pavers to follow. As I neared Williams, Arizona, the federal highway dollars and the construction crews disappeared. For miles on end, I drove on a rutted roadway, which beat heavily at the undercarriage of my rig. Although the average citizen sitting at home might not know it, our taxes often accomplish more than they realize. 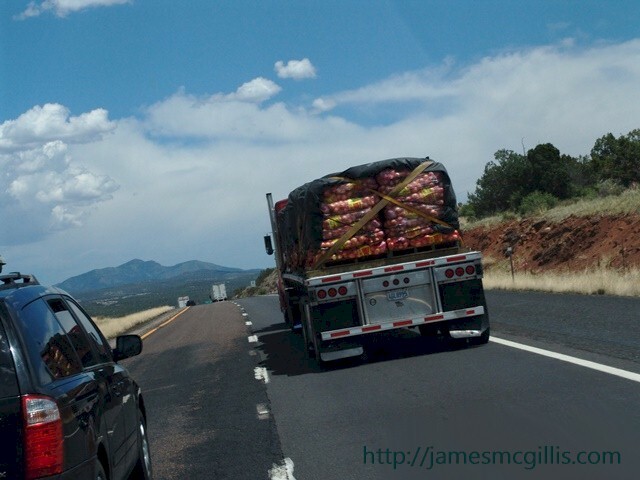 Whether it is a load of onions making it safely to market in the east or tourists and vacationers making it safely to the Grand Canyon, good roads are essential to our economy. When I reached Flagstaff, I was pleased to be on time for my afternoon meeting. I was also pleased to see Americans at work, helping other Americans safely reach their destinations. Here is to the water truck drivers, the pavement crews and the highway engineers who make safe travel available to all in our great country, the United States of America.